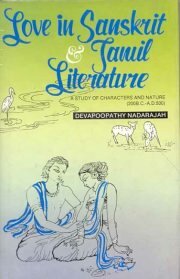 This book compares and contrasts the characters and Mother Nature depicted by the poets and dramatists in the treatment of love in sanskrit and Tamil literature.While both these literature accept the hero and the heroine as the main characters in the drama of love, others like the harlot who contributes to the "love triangle" the friends of the hero and the heroine as well as their relatives, dependants and a number of other people have their own role in providing the cultural and social restrictions or encouragement that develops the emotion fully. Associate Professor Dr. (Mrs.) Devapoopathy Nadarajah has been on the academic staff of the department of Indian Studies, University of Malaya since 1966 after a short stint as a school teacher. A Malaysia, she is fluent in Tamil, English and Bahasa Malaysia. She lectures courses related to Indian culture and tradition, Tamil literature and sanskrit language and literature.Actively involved in some of the leading Shaivite institutions in her country she has been awarded the title of "Saiva Siddhanta Kalanithi" by the Guru Manasannidhana of Dharmapuram, Tamil Nadu.